Alice-Miranda and her friends are in Paris, they have been asked to sing at several events for Fashion Week and they are tres excited. There is more going on than work for them, it is a great opportunity for them to explore the fabulous city. What is fashion week though without some corporate espionage. A couple of designers have big secrets and somehow Alice-Miranda and friends find themselves involved in ways that don’t involve singing. Will Christian Fontaine get his stolen fabric back and will the children be able to help the strange boy who lives across from their hotel? This is a light, fun, fantastic read and it totally doesn’t matter if you have an interest in fashion. Fashion is the setting, a convenient backdrop for the wealthy but the story is more about the children and their interactions. Alice-Miranda is infectious, her openness and niceness are quite simply contagious. The mystery at the heart of the story drags you in and you really want to know how it all plays out. Each of the children has a unique personality and you can’t help but feel like an observer of a small school excursion, the sort of one I would never even thought to dream about. 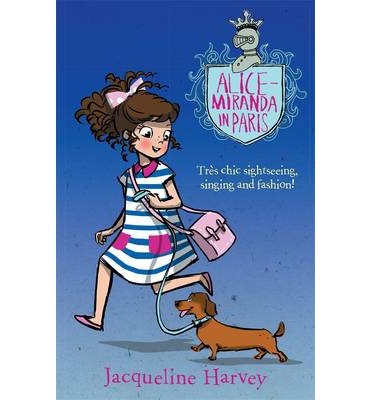 There is a wonderful ambience around Alice-Miranda that is engaging and makes you want to seek out other stories about her. Harvey has wonderfully bought the Parisian scene to the page and it begs you to make the journey.